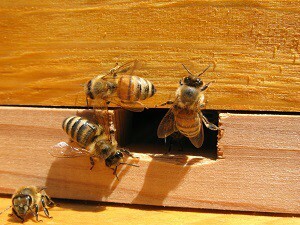 Thank you for visiting us at BaldwinBees.com, online home of the Baldwin County Beekeeper Association. We’d like to also invite you to join us at one of our regular monthly meetings that are typically held on the first Monday of each month at the PZK hall, 17933 State Hwy 104 in Robertsdale, Alabama. Explore our little place on the WWW for information sharing about the rewarding, interesting, and important hobby of beekeeping. Honey Bee swarms are a natural biological event. Although swarms normally occur during the spring months of April and May in Alabama, they could happen in other months as well. Beekeepers do their best to prevent their own colonies from swarming throughout the year but often nature will not be cooperative. Conditions that include abundant nectar and pollen become “trigger” points for colonies to swarm as a natural means of ensuring continuation and growth of the species. 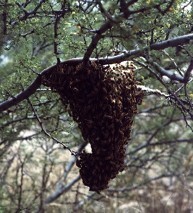 Swarms issue after the queen has laid an egg; the colony has fed that egg in such a way that a queen cell develops (a swarm cell); a short time before the new queen cell hatches about one-third to two-thirds of the colony swarms out of the hive and normally congregates on a tree or other object approximately 30-40 yards from the originating colony. The massive “bunch of bees” at this point ensures that the original queen has made the flight and is within the swarm population. Scouts now begin identifying new locations for the swarm to reside and build a new hive. After negotiations within the swarm and scouts, a location is selected and all the bees relocate to the new location. The swarm will generally only stay in on its initial swarm point for one to three days while the scouts are identifying potential new locations. Swarms are generally not aggressive. They do not have brood (eggs/larva) or food resources to defend. Public concern over locations of swarm points (personal residences, schools, day care centers, senior centers, etc) are understandable. Our members listed below provide swarm removal services. What can I do about honey bees in my walls, attic or other structures on my property? If you have honey bees that have moved in to a structure a beekeeper may be willing to perform a “cut out”, or help you open up the wall and remove the bees and their honey, wax, and brood (immature bees). 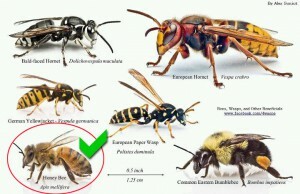 Cut outs can be difficult and expensive, but is preferable to simply killing the bees. Killing bees but leaving honey and dead brood within a structure can cause rot and mold, and lead to infestations by ants, mice or other critters looking to consume the honey. Some extermination companies will refuse to kill bees as they know their value to the environment. Of course they will charge for their service. Contact one of the providers below for specific information. It is usual for the person doing the removal to take the bees and honey that is removed. Some removals require removing parts of internal or external walls or branches/limbs. The person doing the removal will discuss this with you and generally will advise that they will not be responsible for repairs. Some who do removals charge a fee in addition, others do not. Discuss this in advance and ask questions so that the experience of saving the bees is a pleasant and profitable one for all involved. The chart below will help to identify the flying insect so that you can determine who should be called. 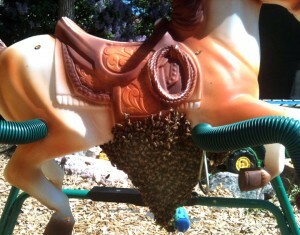 Bee Keepers will generally not remove other than honey bees. Are these bees Honey Bees? Contact any of the following beekeepers if you have unwanted honeybees on your property. They are willing to remove swarms on a voluntary basis and are not employees of the BCBA. It will be up to the individual to discuss removal and make arrangements for a convenient time and any charges they deem necessary. Even with all of the information available on the internet, there is no substitute for one to one discussion. Anyone that would like to talk to someone about their bee problems or concerns may contact any of the following Baldwin Beekeeper Association members. These members have volunteered and are ready and willing to help you with your hives.